As I get older with each passing year, I’ve begun to process the world—and, by extension, cinema—in a different light. While I’m not turning into an outright prude, I am becoming much less tolerant of art and entertainment that takes a condescending and contemptible attitude towards humanity. On an ethical, theoretical level, there’s no denying that the way to best appreciate and enjoy a movie like Killer Joe is to look down upon and get a hilarious kick out of all the underprivileged, uneducated, bad-decision-making redneck idiocy on display. Shocking violence and rampant stupidity? No thanks. But not so fast. In the case of William Friedkin’s second feature film collaboration with playwright/screenwriter Tracy Letts (the first was Bug), the complicated-to-swallow truth is that it is so well acted and spins into such outlandish directions that ethics be damned. As much as I want to say that I don’t approve of Killer Joe, I can’t do that. This movie is one seriously gonzo romp. The story will be recognizable to anyone who’s seen even one noir thriller, but here, Letts and Friedkin ratchet it into a realm that I can best describe as inbred noir. In small-town Texas, Chris Smith (Emile Hirsch) owes a fat chunk of money to a dangerous man. He pitches his lunkheaded dad Ansel (Thomas Haden Church) on the idea of knocking off Chris’s mom/Ansel’s ex-wife in order to collect her $50,000 life insurance policy, which will be paid to Chris’s pretty little sister Dottie (Juno Temple). 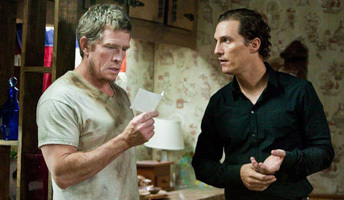 Ansel grudgingly relents, so Chris calls up Killer Joe (Matthew McConaughey), a Dallas cop who also moonlights as a sleazy, but incredibly effective, contract killer. Add Ansel’s new wife Sharla (Gina Gershon) into the mix, and let the games begin! One can only hope that Matthew McConaughey keeps riding this current crest of activity, for his appearances in this film, Bernie, Magic Mike, and Mud signal a return to form that emerged with legendary gusto in Dazed and Confused, only to be muddled by a series of multiplex rom-com turds in which our handsome Texan stud played wooden heartthrob to the likes of J.Lo, Kate Hudson (on multiple occasions), and Jennifer Garner (full disclosure: all I’ve ever seen of these “turds” is their posters). Having to play a very difficult role, Juno Temple is more than committed; she’s convincing. Yet while the performances are assured across the board—Hirsch and Gershon should also be acknowledged, as this really is an ensemble piece—Thomas Haden Church’s is the most exceptional of all, for he somehow manages to bring depth and humor and humanity to a character of severely one-dimensional proportions. His appearance alone brings warmth and credibility to this nearly farcical world, which is filled with nightly Texas downpours (?) and increasingly hard-to-swallow boneheaded behavior by pretty much everybody. Speaking of “hard-to-swallow” and “boneheaded,” when Killer Joe finally launches off the cliff into its WTF?! third act, you’ll finally understand why this film has earned a dreaded NC-17 rating. Once witnessed for oneself, it promises to be some time before a chicken leg, or Gina Gershon, or Matthew McConaughey, are looked at with some semblance of normalcy again. Walking out of the theater a few minutes later as the credits roll, as much as you might want to stifle your grin and chastise Friedkin and Letts for having the audacity to turn human stupidity into a work of entertainment, you might be surprised to find yourself realizing that this movie actually is a responsible morality tale. It’s just a gleefully twisted and crazy backwards one.